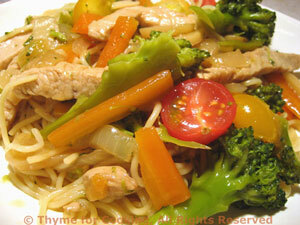 Turkey Lo Mein, Thyme for Cooking gourmet menus. This is a spring version of Lo Mein, with cherry tomatoes rather than mushrooms; lighter and fresher. You can either use turkey cutlets, cut into strips or part of a turkey tenderloin, cut into bite-size pieces. Almost any vegetable, cut small, will work in this. It's a great way to use up the odd bits left in the fridge. Heat olive oil in large nonstick skillet over medium-high heat. Add onion, celery to skillet and stir-fry for 2 minutes. Add garlic, ginger, and stir-fry another 2 minutes. Remove onions/garlic from pan and set aside. Add broccoli and carrots to skillet and stir-fry 5 minutes. Return turkey and vegetables to pan. Add chicken stock and bring to a boil. Remove cover and add cornstarch mixture and stir until thickened. Add tomatoes, drained spaghetti and toss well to coat. Serve.